You will feel right at home in this comfortable 1,800 square-foot premium townhome located in the upscale Highland Greens community – 3 miles from downtown Breckenridge and the ski slopes, and right next to the Breckenridge Golf Club (27-hole, Jack Nicklaus-designed course). An ideal lodging choice for families or small groups of 8-10. This home features in-floor radiant heat, a fully equipped gourmet kitchen with solid granite counters, cherry cabinets, and dining table for 8. Relax in the comfort of the cozy living area, which has a 50" flat screen TV, DVD player, leather sofa, loveseat, recliner, and a gas fireplace. Step outside to your deck and enjoy a private hot tub for your après ski pleasure! A main floor “mini-master” bedroom has an en-suite bath, queen-size bed, TV, and views of the Ten Mile Range. Upstairs includes a master bedroom with king-size bed, walk-in closet, 5-piece bath, and TV; the second upstairs bedroom includes a queen-size bed, TV, and spectacular views of Peaks 7 and 8; and the third upstairs bedroom can accommodate four people with twin bunk beds, a twin bed with trundle, and ski slope views. Queen/King bedrooms are equipped with pillow top mattresses guaranteed for a good night’s sleep. A COMPLIMENTARY private shuttle provides door-to-slope service (on the hour) for guests at Highlands Greens during ski season, and will take you to town in the evenings upon request. If you are driving, this home’s two-car HEATED garage will keep your family warm as you un-pack, will keep your cars free of snow and ice, and has storage for your skis and snowboards. All this is topped off with the breathtaking Rocky Mountains right outside your door, an additional 5 world-class ski resorts close by (Keystone, Copper Mountain, Arapahoe Basin, Vail, and Beaver Creek), an additional three championship golf courses within 15 minutes, fine-dining and shopping in Breckenridge, and nearby Silverthorne outlets (local shuttle transportation throughout Summit County), cross-country skiing at the Nordic Center next to Highland Greens, snowmobiling just up Tiger Road; fly fishing directly across the road in the Blue River, and a biking trail system from Breckenridge to Frisco to Vail, accessed just across the road. Many festivals and concerts are offered year-round, including the National Repertory Orchestra at the River Walk Amphitheatre. Distance to Denver International Airport is 98 miles. This home is utilized and managed by the owners, with careful attention paid to every detail in order to maximize your comfort and enjoyment. No smoking and no pets. Bob and Rhonda live in a suburb of Denver, Colorado. Our family has been skiing, hiking, and mountain biking together for 25 years. 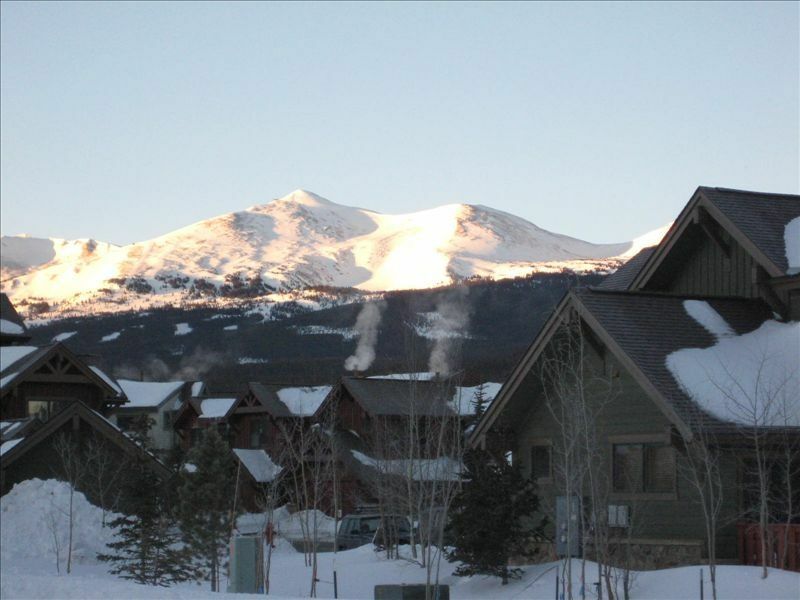 We have two children, and all of us enjoy the many activities Breckenridge offers year-round. We have traveled all over Colorado, and yet always found ourselves going back to Breck time and time again. It is our favorite mountain town with it's unique, historic charm, not to mention an awesome ski mountain. Highland Greens is a great location, three miles from downtown and right next to the golf course and Nordic center. With the hourly shuttle to the slopes, you don't have to carry your skis any farther than your front door. The shuttle drops you off just steps from the lift. During the summer we enjoy the biking trail across the road, and like to ride into Breckenridge for breakfast or lunch, or into Frisco and ride around lake Dillon. Ski slope views of Breckenridge ski resort from two bedrooms, mountain views from every room and deck. Heated Garage. There is parking for up to four cars: two in the garage, and two directly in front of garage. No other parking is available. High speed cable internet with secure wireless signal. Password information provided in home upon arrival. Board games such as Clue, Monopoly, etc. Golf nearby at Breckenridge Golf Course. We had a little trouble checking in as there was a power outage prior to our arrival that messed up the locks. Once we were in things were great! We had enough space for everyone and a pack and play for the baby. The shuttle picked up like clock work and headed to the slopes. We couldn’t have asked for better convenience. The house was fully equipped and clean - would definitely stay again! Great location, cozy place, responsive owners. Would definitely rent it again! We stayed here for a summer family vacation and had a great time. A few family members were affected by the altitude and were grateful for the house as we spent a lot of time there. We especially like the location of the property, close to trails right outside the back door, and w/in a short driving distance of either Breckenridge or Frisco. Everything was very nice and the perfect size for all of us who stayed, and other family members we hosted for dinner a couple of nights. One small issue I've had since returning is the refundable deposit hasn't been received yet. I was told it could take up to two weeks, that seems a little longer than other VRBO places we've stayed. Otherwise, it was a great place to stay for vacation!! Thank you for the feedback! The deposit was refunded on 8/18, two weeks after departure. This is set up to happen automatically within the VRBO payment system. There was no delay in the deposit return, but we will try to make this clear to our guests in the future. I am glad you enjoyed your stay and look forward to hosting you again in the future! We will be back. Great location, great property. The manager was so willing to help (I had to text her with a question). Wi-Fi worked great. Nicely furnished, spacious and convenient. The “Highland Greens” shuttle was great. Wonderful property with all the comfort of home. Clean, cozy, well maintained, well stocked with everything you will need for a comfortable stay. The owner was easy to contact and replied quickly whenever we contacted her.We will definitely come back . Rates include all cleaning fees. Rates subject to change until reservation is confirmed.